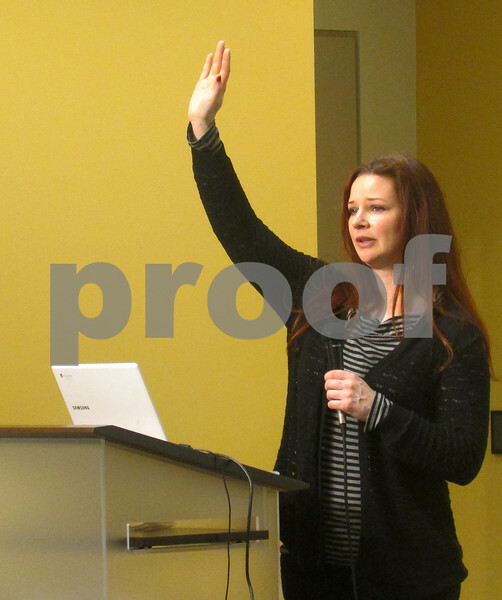 Sarah Moses of DeKalb raises her hand Feb. 18 as she addresses the crowd at a meeting of Action Steps for America at the DeKalb Public Library. Activist groups across the country are pushing Republican congressmen with ties to President Donald Trump to hold town hall meetings, which have at times devolved into shouting matches. "We're a nonpartisan group," said Moses, organizer of Action Steps for America. "Everyone here is against dangerous policies for the U.S."